All of the changes at the Art Gallery & museum over the past few years have led to a much closer way of working between all the areas of the collections. For the first 6 years I worked almost exclusively with the Fine & Decorative Arts collection, initially under James McGregor and since 2008 under the current Keeper, Victoria Partridge. Since the collections have been packed away and we all moved off-site I have been documenting and reconciling the Foreign Archaeology and Ethnography collections, working closely with Liz Pieksma, the Keeper of Archaeology. This post is also a collaborative effort between the two of us. One of the first things I had to learn about these kind of collections, in comparison to the art collections, is the importance of location context: where they were made or found is crucial to understanding. The location can be a very different kind of starting point for these collections. Of course with art, you can look at the output of a London art school between 1890-and 1910 or a Bedford Arts & Crafts furniture manufacture, but the whole process of engaging with an archaeological context is quite different. The objects in this sense are more important to archaeologists as carriers of information - a broken pot to an art historian needs repairing, to an archaeologist it reveals the material the pot was made of which can date or locate the origin of the pot which can tell you about trade, population migration or all manner of things. I chanced upon all of this when while writing about architecture in Bedford. I was looking at an online map of listed buildings, and followed a link to a map of scheduled ancient monuments - archaeological sites registered as significant. This showed me far more sites in the Bedford area than I expected, including an oval barrow just west of Queens Park in Bedford, an area I once lived. I asked Liz about how to go about finding out about a site from the location and whether we had any finds, and this led on to the main point of this blog. The barrow, I learned, was on the edge of a very important area known as Biddenham loop, a landscape enclosed on three sides by the meandering River Great Ouse. The history of it I'll let Liz explain, but this led me on to the other organisations that the Museum works with with regards to archaeological records. The area has been well researched in the past 20 years or so, and was allready earmarked to feature in our new displays. 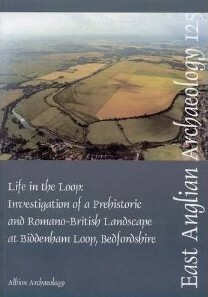 The archaeology in the area has been done by Albion Archaeology and Mike Luke has produced a book, Life in the Loop, of their findings. When all the research is complete they pass their finds to the Museum and their records to the Bedford Borough Historic Environment Records (HER) department. The book sums things up nicely, but if we want more information or images for displays it will be HER that we go to. HER, as well as Bedford and Luton Archive Service (BLARS) will possibly also have records of more recent life and occupation of 'the loop' which can add to our understanding of the entire history of the site. The recent excavations prior to the expansion of development around Biddenham and the even more recent publication of all of this archaeological evidence and research has enabled a fascinating series of landscapes for the area around Biddenham to be understood. Evidence for the earliest settlements in the Palaeolithic, the Mesolithic and the Neolithic is sparse. Concentrations of manmade flints along the edge of the river terrace but out of the flood plain, show human activity whilst several rectangular enclosures and an oval shaped monument strongly suggest ritual and funerary ceremonies took place. The evidence for human activity during the later Neolithic/ Bronze Age is more abundant and the presence of pits and flint concentrations shows that the whole area within the loop of the river is being utilised far more. The presence now of three separate barrow cemeteries spread out across the woodland landscape shows the continuation ceremonial importance of the area. Towards the end of the Bronze Age and into the Iron Age the settlement becomes more organised. A larger, main settlement on the western part of the loop becomes established with a smaller area is situated to the east. However the most interesting feature of this period is the establishment of a numbers of deliberately dug pits which form a line across the southern part of the area between the bend in the river .This line of pits would have been a very significant feature in the landscape and has been interpreted as a physical boundary. In the middle and later Iron Age the settlement pattern transforms into six separate farmsteads spread out along the river terrace. Several of the small farmsteads were found to have round houses and storage pits at their core and two of them were situated at either end of the earlier pit alignment. The pattern of small farmsteads continues into the early Roman phase and becomes more formalised with the addition of individual enclosure ditches to demark space. The presence of individual burials on the outskirts of the farmsteads and a small cemetery next to one particular farmstead shows that the people farming in the area were also buried there. Overtime it seems that enclosures, boundaries and track ways around and between the farmsteads become more established in the landscape. The overall impression is that the small farmsteads situated close to the river terrace were using the interior woodland and grassland communally. Evidence from the excavations shows that few finds or features dating to the Saxon period were recovered and this strongly suggest that whilst people still remained in the area it was at a much reduced level of activity. The remarkable story to come out of this archaeological investigation is that people have been using a range of natural resources over and over again through time. The constant resources have been the river, the floodplain for pasture and the wooded interior for grazing. Amongst this landscape they have made farms, worshipped and buried their dead. Over the last few months I have been getting to know the families that live in Great Denham and meeting residents of the very large new housing developements there. I think they and the Parish Council will find this blog post extremely interesting. Roads there have been named to reflect occupation during the Saxon period - e.g. Saxon Way and Mercia Road - perhaps they should also make reference to these earlier settlements!